The Comprehensive RF Technology Reference! The ARRL Handbook for Radio Communications is a complete reference and guide to radio technology principles and practices. Since 1926, The ARRL Handbook has been a trustworthy source of introductory, applied, and theoretical information. Now in its 96th edition, The Handbook continues to advance the pursuit of experimentation and innovation by radio amateurs and professionals. Each edition contains new and useful material to support Amateur Radio activity from the traditional short- and long-wave frequencies through microwaves! System Requirements: Windows 7, 8, or 10; Windows Vista or Windows XP, as well as Macintosh systems, using Adobe Acrobat Reader software. Acrobat Reader is a free download at www.adobe.com. PDF files are Linux readable. Other included software is Windows compatible, only. Welcome to the 96th edition of The ARRL Handbook for Radio Communications. First published in 1926, “the Handbook” has guided and supported generations of radio amateurs. Like Amateur Radio itself, The ARRL Handbook is continually being updated and renewed. Far more than the work of a few people, this book represents the work of an entire community. Knowledgeable experts write original material and revise sections as technology and operating practices change. The editorial staff strives to make the material clear and easy to read and apply. A talented staff at ARRL Headquarters (“HQ”) makes sure the layout and graphics are attractive and professional. Finally, the readers themselves contribute by asking questions, pointing out new areas for material, and by submitting feedback on the finished product — thank you! Another set of changes began with the 2018 (95th) edition as the CD-ROM sent with every book was dropped in favor of a downloadable set of supplemental material. This eliminated many problems associated with supporting multiple operating systems. Please do look for the “download code” at the beginning of the book (included with the print edition only) and use it to download and install the material to your computer’s hard drive. There’s a lot of great material waiting for you! 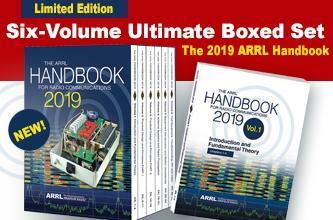 I hope you enjoy The ARRL Handbook and find it useful, whether you’re a new ham just learning the ropes, an experienced ham enhancing a station or skill — or even if you’re not a ham at all (yet)! Our goal is to provide you with a solid, trustworthy source of information to help you make the most of your Amateur Radio interests, whether that is public service, experimentation, radiosport, or making friends around the world as hams have done for more than a century. Thanks for being a Handbook reader! The ARRL Handbook for Radio Communications will be available from ARRL and publication dealers near you soon.